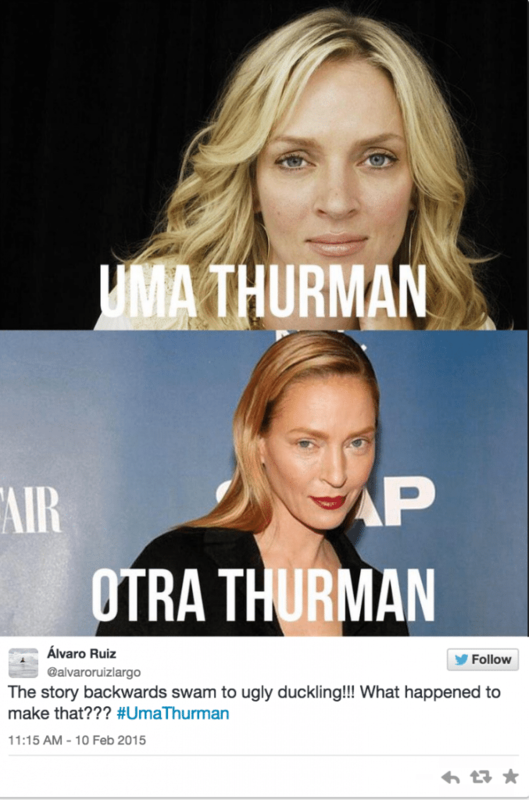 Uma Thurman plastic surgery: Damned if she does, damned if she doesn’t. 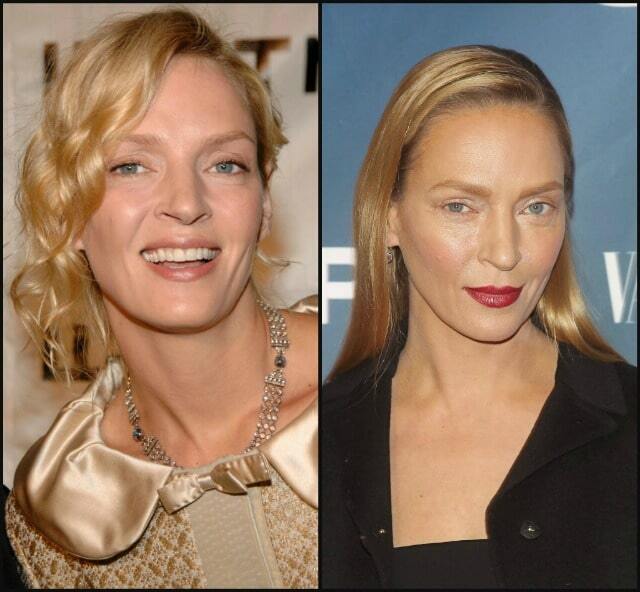 Home Pop Culture Uma Thurman plastic surgery: Damned if she does, damned if she doesn’t. 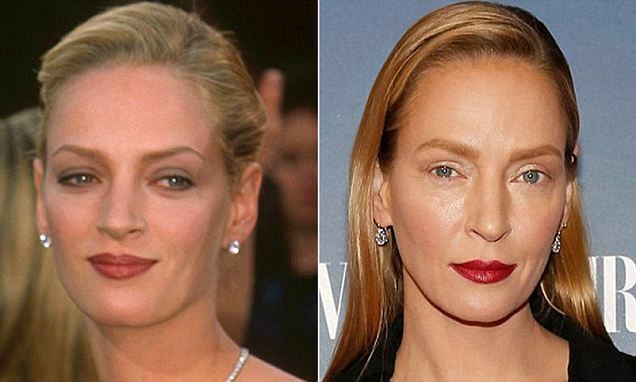 Does Uma Thurman owe us an explanation for what appears to be a new artificial look? It seems actress Uma Thurman, 44 has achieved little respite after tabloid land went hunting, looking for tell tale signs if she had had any recent plastic surgery and if so to what extent after a Monday night new premiere soiree appearance? The answer in short, quite a bit and quite a lot. What though might make for interesting discussion is what may have necessarily have led to the normally strong jaw, high cheekbones actress to have pursued such resource? 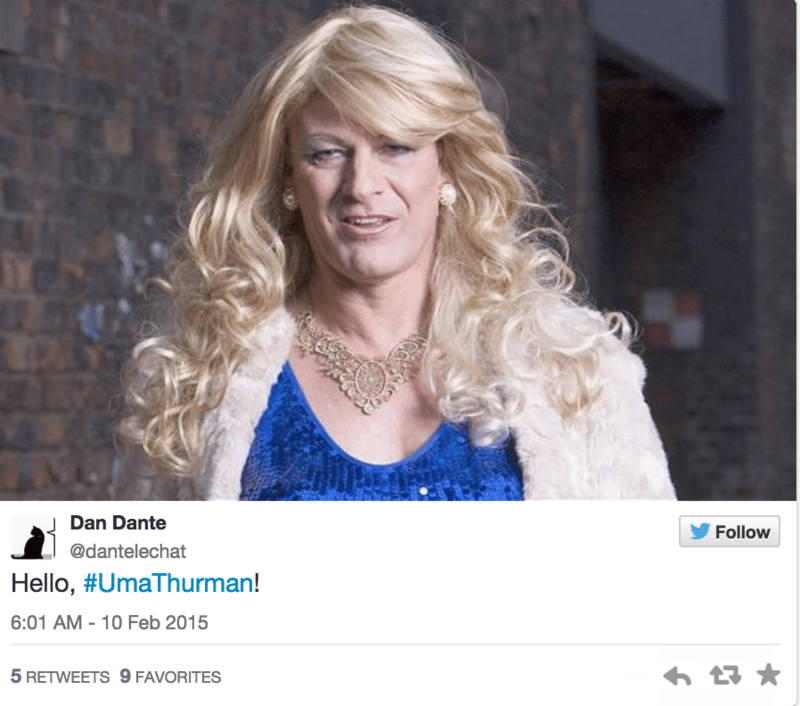 As it turns out quite a lot actually…. The public spectacle that has since run along the lines of, ‘Oh no!! What did Uma Thurman do to her face?’ perhaps non coincidentally parallels a similar duck and weave when actress Renee Zellweger was this past fall photographed looking markedly different from her usual idiosyncratic self. Needless to say the actress was forced to play dumb, deny she had had any surgery or procedures (whose business is it anyway?) whilst gushing it was simply the effects of poor lighting and make up or the lack of it. Pick your choice. Opined Norfolk, (brace yourselves kids): ‘Uma certainly looks like she’s undergone a dramatic transformation and in my opinion, she’s looking too overdone. ‘The thing that strikes me most is that her eye area looks very different. It looks as though she’s had a recent lower blepharoplasty treatment, also known as eye bag removal. She isn’t wearing any eyeliner or mascara, probably in order to avoid infection from the new surgery. Not finished Norfolk would then speculate on the degree of botox use the actress had done and how badly she apparently (in the doctor’s opinion) botched things up. Reiterating: ‘Her forehead is also very prominent and looks rather elongated, shiny, taut and line-free, which are all classic tell tale signs of regular Botox use. I would suggest that she’s had too much product injected into this area, which is contributing to her brow and upper eyelids looking very heavy. ‘The combination of these possible procedures is making her look less youthful, and we’d advise Uma to lay off the treatments for a while and if and when she does have them, to remember that less is more. Added Alison Telfer of the Glasshouse Clinic for good measure: ‘Uma has long been known for her very chiselled jawline. As much as this is seen as a valued asset in younger years, having a chiselled jawline can be very ageing as women get older. ‘It looks like she’s had dermal fillers around the jawline with the aim of making her appear more youthful and fuller faced, but this has made her jaw look broader. ‘She also looks like she’s had dermal fillers in her tear trough area (which is just under the eyes). I’d predict that this has been done fairly recently and will probably settle soon. Then again what could the actress have done anyway? Like many actresses (never mind mere mortals), Uma’s looks were bound to be criticized as is the passing rite of any one of us in the public eye. Too fat, too skinny. Too taut, too wrinkly. Too fake too aged. Who can ever win in such a situation if one is forced to live for the sake of other’s expectations, which sadly is the lot of many women, especially once they reach past the age of 45 as they are reminded over and over their value is contingent on their sexuality (or still having it) and their youth. A woman we are reminded must always approximate to these ideals because in America a woman is really only worth conditional how good she still gets to look in a bikini, how good she looks when the paparazzi are indiscriminately flashing lightbulbs at her and how perfect or close to perfect she remains as long as she resists aging or betraying any signs of mortality.